Hillsborough, Pasco and Pinellas Counties are looking for your input on what is needed to fix Tampa Bay area traffic issues. 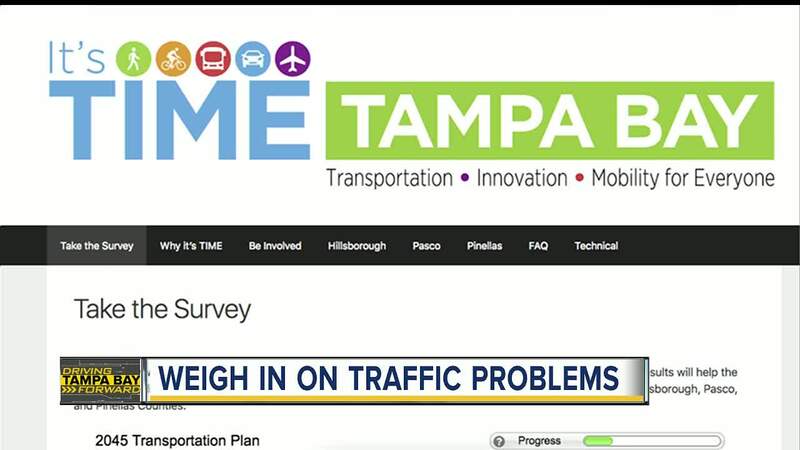 TAMPA, Fla. — Hillsborough, Pasco and Pinellas Counties are looking for your input on what is needed to fix Tampa Bay area traffic issues. Your thoughts are needed on three very different transportation and growth scenarios. Survey results will help the three Metropolitan Planning Organizations create the very first tri-county Long-Range Transportation Plan for Hillsborough, Pasco, and Pinellas Counties. It's Time Tampa Bay has developed three different long-range solutions. Individual elements of each scenario may be combined into a final regional plan. By 2045, our region will have over a million more people living and working here, according to It's Time Tampa Bay. 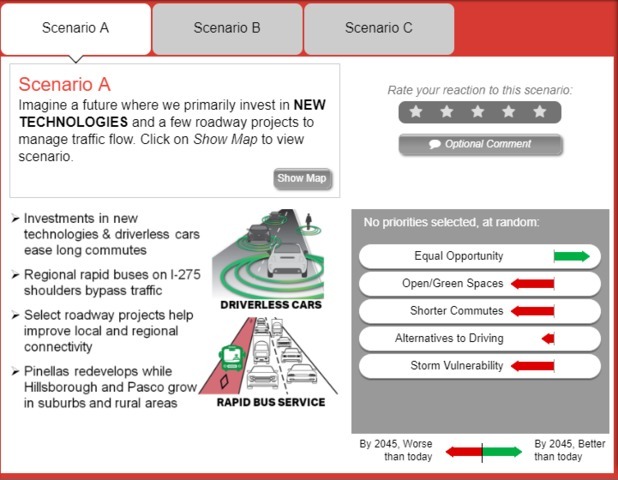 Scenario A imagines a future where we primarily invest in new technologies and a few roadway projects to manage traffic flow. Scenario B imagines a future where we primarily invest in expressway lanes forming an outer loop so traffic does not have to go through the congested center of the region. 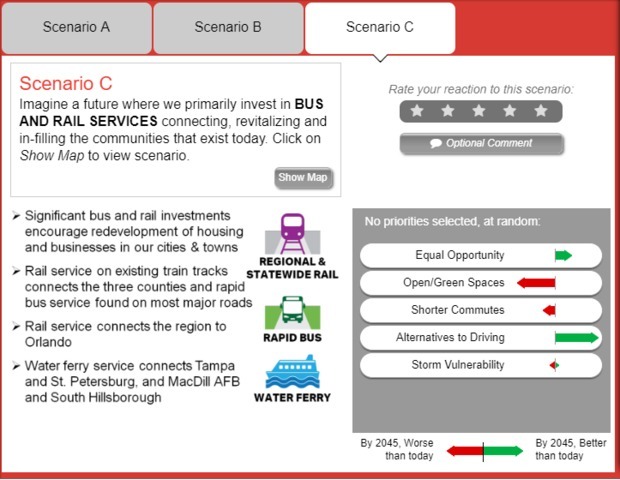 Scenario C imagines a future where we primarily invest in bus and rail services connecting, revitalizing and in-filling the communities that exist today. 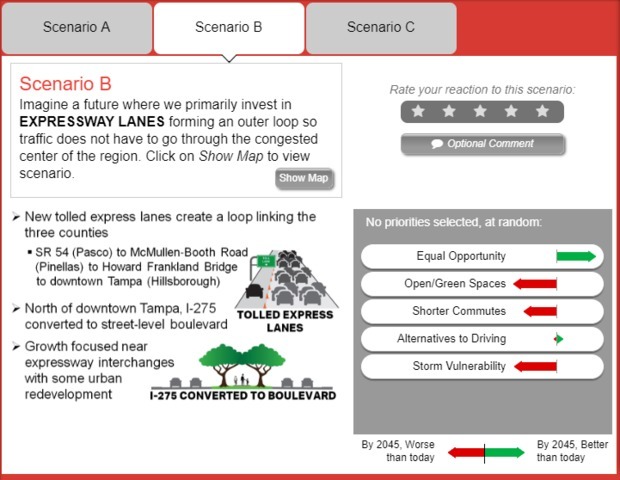 It's Time Tampa Bay also asks residents to evaluate different priorities of what should be in the plan, including whether counties should invest in smart infrastructure to support driverless vehicles and better manage traffic flow. For more information on Its' Time Tampa Bay, click here .